Ok, so this one is probably not a very influential figure, but Lynda R. Farley is so colorful that we can’t just let her be. Farley drew a bit of attention to herself when she was part of a “million” veterans marching on Washington DC (more like a few hundred) to protest Obama in 2013, presenting herself as the “Smoker on Strike” with messages like “George Washington, father of our country & a smoker!” and “the person who first promoted the lie that ‘smoking causes lung cancer’ was Adolf Hitler” (not entirely accurate, but that’s not the main problem with the message), presented in … unusual combinations of colors, fonts and capitalizations – nothing compared to her website, though, which is absolutely amazing (she calls it “the most beautiful pages on the WWW,” and it is hard not to conclude that she really is unable to distinguish between “I say so” and “it is the case”). 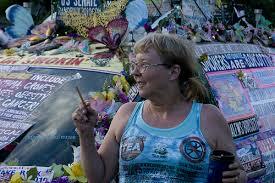 Even her website cannot compare to her car, the “liberty van” (do look it up), however. One of her own rants is here, and she also links to this, shall we say, “interesting” website of “research”, mostly consisting of the rants by the late Lauren Colby. The basic idea is that you cannot trust science, since most scientists are funded by the powerful anti-smoking industry. Since you cannot trust the scientists, it apparently follows that any beliefs you may have about the issue are equally valid. Farley herself adds that “it seems God created all of us with NICOTINE RECEPTORS IN OUR BRAINS. And, nicotine is a form of NIACIN – which is a VITAMIN.” So there. She also links to the pro-smoking works of William Campbell Douglass, whom we have encountered before. Other than that Farley seems predictably enough to promote a variety of wingnut conspiracy theories such as global warming denialism. Diagnosis: Not very influential or likely to be taken seriously by many, but the kind of lady who simply adds some color to our Encyclopedia, the Internet and wingnut protests. And her main platform is crazy enough to impress even us. "...nothing compared to her website, though, which is absolutely amazing..."
I would characterize her site as an online expression of ADHD. No disrespect intended to actual sufferers of ADHD, including me! Bubba: Doesn't excuse the colorblindness or the being dumb as a brick. I have ADD too, and I keep my websites tidy and readable. There's trying to add pizzazz, and then there's what she's done, which clearly indicates that she has no idea what she's doing when it comes to cyberspace. The KJV doesn't say 'thou shalt not drive the wrong way on the interstate,' either, Ms. Farley. Niacin is also known as nicotinic acid, which is how she got the idea that nicotine is a vitamin. In fact, the two chemicals are unrelated to each other - they both just happen to be named after their discoverer, a long-ago french chemist named Nicot. How long do you reckon it will take before a news story emerges of "Lynda Farley, pro-smoker, dies of lung cancer"!